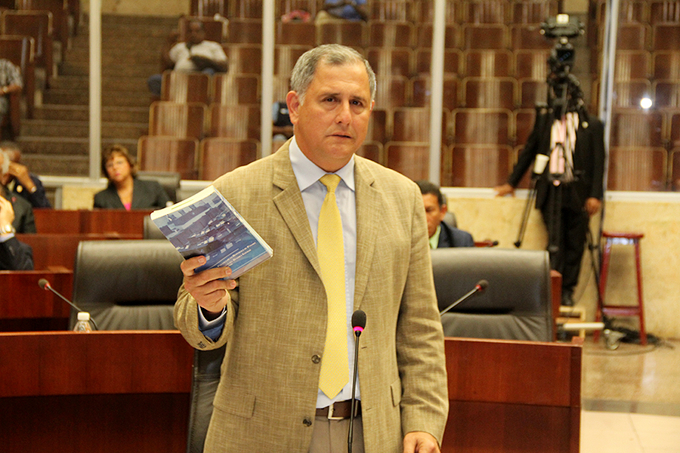 Juan Carlos Arango shows us a book, but not his constitutional proposal. Photo by the Asamblea Nacional. The National Assembly’s 52-18 rejection of Juan Carlos Varela’s nominees for the high court was not a sudden shock. That only one deputy who had been elected on the Cambio Democratico ticket broke away to vote with the president — and that guy had already left to form his own breakaway party — was perhaps the biggest surprise. With Martinelli and so many of his people being investigated or prosecuted, figure that a vote to put the anti-corruption prosecutor on the high court would be much more than a tacit break with Martinelli’s party, even if he has been stripped of the CD presidency. But when the December 15 announcement of Varela’s appointments was greeted with near-unanimous public rejection, and then the special legislative session meant to approve these nominations came and went without even a committee vote, it was pretty well shown that the president didn’t have the votes. To write “crisis” in bold letters amidst that debacle, we had a judge “lose the file” in perhaps the most far-reaching and emblematic of the Martinelli corruption cases, that part of the Financial Pacific affair related to international insider trading on the Petaquilla Gold pump and dump scheme. Although the regular courts have no jurisdiction over Martinelli — only the Supreme Court does — cases of others involved might make people turn state’s evidence and that could be most important because this is probably a murder case. Securities Markets Superintendency senior analyst Vernon Ramos was investigating this matter when he suddenly disappeared in November of 2012. After “losing the file” — which was recovered by a citizen alongside the Ensanche in Arraijan and turned over to prosecutors — Judge Felipe Fuentes blew the whistle on time for investigation, with several of the principals in hiding and most likely abroad. That ruling is under appeal and Fuentes is under criminal investigation, but the basic structure of the Code of Criminal Procedure says that criminals get to flee until statutes of limitations expire and then come back without any worry of prosecution. Even when they don’t flee, if they have the money they can send in waves of lawyers to file endless motions that tie up the courts until time runs out. Panama has no tolling statute to discount time in hiding, in flight abroad or in defense-caused delays from the time running toward the limit. New revelations of widespread public corruption, new excuses why the public has no right to know the extent of it and a high court now largely run by alternates and temporary holdovers aggravate long-standing public dissatisfaction with Panamanian justice. President Varela’s rejection of any sort of public consultation before his next choices for Supreme Court magistrates makes it considerably worse. So what are the alternatives? Various individuals and parties are beginning to broach the subject of a way out, a few more seriously than the rest. From the president’s team come three probable nonstarters. Prior to the vote against Varela’s nominees, Vice Minister of the Presidency said that discussions have been underway about constitutional reforms, including about a possible constitutional convention. The president can convene an election of delegates to such a convention, but with a cloud of scandal over his acceptance of millions of dollars from Odebrecht — he calls the money “donations” rather than “bribes,” which would still violate election laws — the chances of a slate of his choice winning such an election seem remote. Patches to the constitution would require this legislature and the one elected in 2019 to approve them, which first of all likely lets most of the corruption that has been revealed go unpunished and also presumes that there will be substantial continuity from this legislature to the next, which looks like a long shot bet. Then there is Panameñista deputy Luis Eduardo Quirós, who suggests that what will really fix things is the elimination of all public hearings with respect to Varela’s next batch of high court nominees. Between the four Panameñistas and one ex-CD on the nine-member Credentials Committee, that procedural change could actually happen. But 16 members of that party plus two allies can’t sway a 72-member National Assembly plenum and that sort of procedure would likely inflame both the opposition deputies and the public. The Varela coalition’s junior partner, the one deputy from the Partido Popular, says he has another idea — sort of. Juan Carlos Arango Reese, from the cicruit that includes the Chame and San Carlos districts, says that he has put together a team of experts who have written a proposal for constitutional reform, He mentions judicial reform and the promotion of tourism and agriculture. (No need to rebuild the circuit’s traditional industry, the coastal fishery, nor improve the wretched state of public education in his circuit, apparently.) He made his announcement with book in hand, but didn’t actually reveal what he proposes. Instead he offered that if more experts join with his experts, there would be a better proposal. Arango appears to suggest new patches to the constitution, but of course he comes from a circuit that notoriously doesn’t re-elect its legislators. However, if what Arango has or means to have is a draft of a new constitution, perhaps his small party could go into an election for delegate a convention with that draft to run on. Having lost two straight presidential elections and having been split during most of this legislature’s term, the Democratic Revolutionary Party is itching to come back to power, and to exercise the power that voters gave it in the legislature in 2014. This creature of the 21-year military dictatorship is still Panama’s largest political party. Between now and that happening, however, they would have to fight over the party’s soul and direction. Will they become an immigrant bashing party on the Donald Trump model, which is where legislator Zulay Rodríguez would lead it? Will they go back toward the social democratic part of their tradition under the leadership of Nito Cortizo, who resigned as Martín Torrijos’s agriculture minister because he opposed “free trade” policies? Will they continue on as a neoliberal party under a suitably aristocratic leader? Will they just be a political patronage outfit, with a charismatic enough boss to get elected and then to distribute the goodies to enough of the base to keep them happy? In any case, for the moment the PRD is united about not accepting impositions by Varela, especially of high court nominees but increasingly about anything else. Party leader and legislator Pedro Miguel González is hoping for some sort of unity within the Cambio Democratico caucus that allows it and his party to form a veto-proof alliance in the National Assenbly. Then Varela would have to deal with the legislature from a position of weakness and the new majority legislative coalition’s deputies could go into the May 2019 elections having passed a few things to impress the voters. An immediate priority for the PRD is the reconfiguration of the Credentials Committee. Under the vague constitutional guidelines, the Panameñistas should have only two of its nine members, not four. Any move to impeach Varela — a possibility to which González alludes in passing — or to remove corrupt high court magistrates, must go through that committee. So what about constitutional changes? González warns of some system-rigging proposal being jammed through by Varela, leading to an electoral process like the one that Honduras just saw. There seem to be no specific constitutional proposals coming out of the PRD, which might well tear itself apart argung about what should or should not be changed. The constitution is, after all, a product of the same dictatorship that produced the PRD. The nation’s principal bar association, the Colegio Nacional de Abogados, wants well qualified, independent professionals to fill those spots on the high court, and they want their own and the general public’s input on who those might be to form part of the process of their selection. Panamanian society is fairly united about the proposition, but also so jaded that few expect that such a thing could happen. Plus the arguments among the non-politicians are still mostly about the process of changing the constitution, rather than any specific changes to be made or rejected. We shall see what new party leader Rómulo Roux might cojure up. He’s the only major party leader who is not under investigation, facing specific charges or an obvious target for prosecution. Despite being the vice presiedential candidate on her husband’s proxy slate in 2014 — a campaign supported by lots of money of criminal provenance — former first lady Marta Linares de Martinelli has received the customary hands-off treatment afforded to crooked politicians’ families here, so she heads the list of the latter. In any case, CD is on the defensive and not making any serious proposals lately. Former Attorney General Ana Matilde Gómez is out collecting signatures to run for president as an independent. She was the top vote-getter in the 2014 legislative races and the National Assembly’s only independent deputy. The persistent rumor or accusation is that if on the ballot for president she would have the Motta family, for whom she once worked, backing her bid. She voted against Varela’s nominees, citing the process and citing Varela more than any objections to the nominees themselves. Gómez’s proposal about the justice crisis, Bill 155, is statutory rather than constitutional and would necessarily be prospective. It would not help to bring the Martinelli gang to justice. But it strikes the raw nerve of the moment and unlike PRD, Panameñista, Partido Popular or civic group offerings, you can read what the proposal is. Simply put, she would have fugitives tried in absentia. From CD and a few lawyers there are protests that this would be unconstitutional, that it would end the rule of law. But then, nobody wants to hear objections from the Martinelistas, the political caste in general or particularly from a legal profession that has treated the nation to displays of obstruction and delay. A lawyer-skeptical lawyer? That could be Ana Matilde’s ticket to the Palacio de las Garzas next year.